When BBM opened up to Android and iOS users, it was known that it would come along with advertising. For example, in Android, your “Invite” notification may light up and it will be a “Sponsored Invite” – i.e. an ad that most likely leads you to an app download. You simply “Accept” or “Ignore” the “Invite”. If you accept it, you’re eventually led to the app download. In terms of whether this is priced on a CPA (pay per install) basis or per “Accept” I don’t know. It could, of course, be a CPM based on the number of people who are “invited”. I can’t seem to find any information on how a company can even purchase BBM advertising. Possibly the entire idea is in beta and open only to select advertisers. 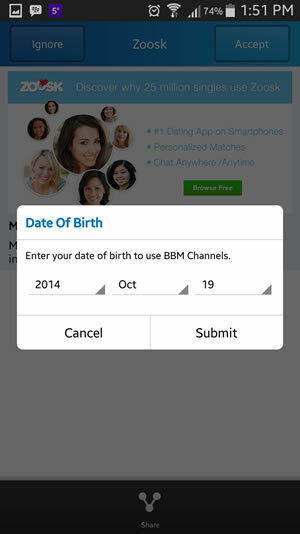 If you have the scoop on how to purchase BBM ads, please let us know in the comments below. Thanks! This entry was posted in App Advertising, Industry, Zoosk. I get, and ignore, a Zoosk BBM invite once per week. They are not controlling sponsored invites as suggested above. I do not want to receive these invites anymore. Please tell me if there is a way to stop this! !